The Sukhoi Design Bureau (OKB) was tasked to develop a long-range interceptor that would be able to contend with strategic threats as well as hold its own against the hottest air-to-air fighter being fielded in the west - the F-15 Eagle. 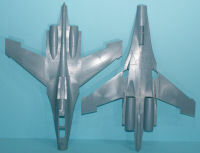 The resulting design bore a similarity to the F-15 from afar, but that is where the similarities end. The Su-27 is more than a match for any contemporary operational fighter, save perhaps the F-22, but its younger brother, the Su-37 will keep Raptor pilots on their toes. One of the first things you'll notice is that the Flanker doesn't usually carry external fuel tanks. I don't believe I've ever seen a photo of an Su-27 with external tanks. That is because the aircraft carries an ample load of fuel internally to conduct long range intercept missions, and when even longer ranges are required, many Flanker variants are now equipped with retractable air refueling probes. Serving as the backbone of the Soviet and now Russian air defense forces, the Su-27 has evolved into a number of variants, including the Su-27UB two-seat trainer, Su-30 multi-role fighter, Su-34 fighter-bomber, Su-35 Improved Flanker, and Su-37 Super Flanker. There is also the Su-47 which retains some of the Flankers lines, though it's forward-swept wings reflect a new generation of fighter awaiting funding. We also shouldn't forget the Su-33/Su-27K Naval Flanker, modified for carrier operations. The Flanker has been exported to China and India, with additional customers being lined up by the Russian aviation export teams. First we have the stock Academy kit. The kit is molded in gray styrene and presented on six parts trees (counting the upper and lower fuselage halves as a tree each) plus one tree of clear parts and one set of rubber tires. Overall, the kit is a simple build and while the exterior detailing is good, the cockpit, wheel wells, and armament leave a little to be desired. In many of the builds I've seen, many folks have opted for the Neomega resin cockpit for this kit but some haven't been happy with the detailing in that set either. The wheel wells are simplistic and the weapons should probably be discarded. Despite those points, the model builds up into a really great looking two-seat Flanker. Very nice set of decals! The number one complaint from builders has been the Academy cockpit, especially since it is one of the most visible aspects of the kit given the huge two-place pit and canopy. Wolfpack as completely replaced the stock kit cockpit and all it needs is a coat of Sukhoi gray in the cockpit ad some careful detail painting to really set this new feature off. The original boxed-in wheel wells are literally cut out and replaced with new resin parts to correct not only the interior of the wells, but the mains also get a new surface fairing to correct the shape of the well openings themselves. One of the more unusual paradoxes are the kit intakes. Academy provided full-length intake trunks down to the engine compressor faces, but then blocked them off with plastic FOD guards. The MiG-29 has a similar arrangement, but its engines can breath at idle through louvers atop the leading edge chines ahead of the wings. The Su-27 has its louvers on the bottom for auxiliary air intakes, but are useless to keep FOD out if they're so close to the ground. The guards on the Sukhoi are actually screens that allow air to feed the engines while the ventral louvers remain safely closed on the ground. Wolfpack has replaced the solid FOD shields with photo-etched screens. 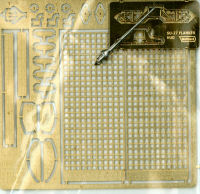 The Academy kit didn't do much for antennas in their release, so Wolfpack provides the IFF and RSBN (TACAN) antennas as photo-etch to provide the proper details missing on stock kits. The weapons are fortunately not needed in this build as the color scheme provided in this kit remains unarmed. 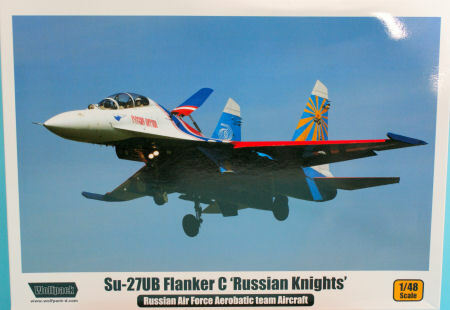 The kit provides markings for one of the nicest paint schemes worn by the Flanker - the Russkie Vityazi - the Russian Knights aerial demonstration team. 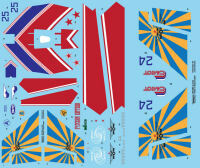 The team consists of a number of single-seat and two-seat Flankers for their shows and this decal set provides markings for two of their Su-27UBs: Bort 24 and Bort 25. The instructions also provide the relevant Gunze colors needed to render this color scheme. When I saw this kit first appear, I was mildly curious what would be in the box, and when it appeared at one of my favorite online retailer's website, I took the leap and bought one. With a retail price of around $85 USD, it was nearly double the MSRP of the Academy kit, but for those of us who are AMS modelers, we'd easily spend much more than that to get the corrections needed to do this kit properly. Wolfpack has bundled up a nice array of details in this kit and I'm quite pleased with their efforts. All I need now is a little extra time to get it built!